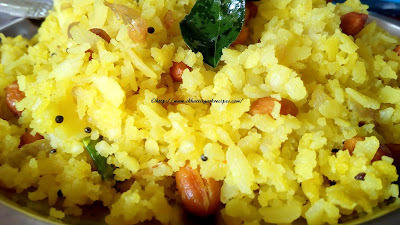 For this Chhattisgarh recipe, Take medium size Poha (beaten rice). Pour some water, wash it thoroughly and drained the water immediately.L eave it for some time. Now give a long thin cut to 1 big onion.T ake 1 potato and give a fine cut to it .1-2 green chilies fine chopped, Chopped Green coriander leaves. Heat cooking oil in a pan. Deep fry some ground nut and keep them separately. Now put mustard seeds,saunf (fennel seeds), curry leaves and green chilies. Let them saute and later mix chopped onion and potato. Once it turned golden brown add some salt, turmeric powder, little sugar and mix them well. Add fried groundnut and soaked beaten rice with the cooked onion and potato mix. Mix them all together slowly and gently. You can cover it for 2-3 minutes then Switch off the flame.N ow Squeeze some lemon juice and mix it well. Garnish with some chopped green coriander leaves. Note: Beaten rice is consumed everywhere in India. There are so many recipes which are prepared with it. Chhattisgarh is not an exception for it. Being a rice producer it is one of the biggest producer and exporter of beaten rice. The Poha is one of the traditional Chhattisgarh food and favorite recipes for breakfast, especially on Sundays. The beaten rice contains many health and nutritious qualities.